Over the last 40 years, we have bred many wonderful dogs, of which 226 became famous showdogs. 4 of these champions you see on the picture who is taken in Almkerk/Netherlands 1993. It shows the Beardie males Ch. Shilstone Diplomat and Ch. 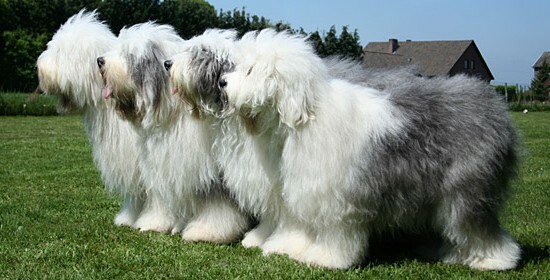 Shilstone Choir Boy together with the 2 Bobtail ladies Ch. Uniclever and Utopia aus dem Elbe-Urstromtal. It is almost 40 years ago that we had our first litter. During the many years 150 OES champions, have proudly and successfully represented us worldwide at numerous shows. Another 8 Bobtails have to be added to this result. They where bought from other breeders but made up as champions by ourselves.